You could look as strong and as cool as Tim L. ….we have T-shirts and sweatshirts available! 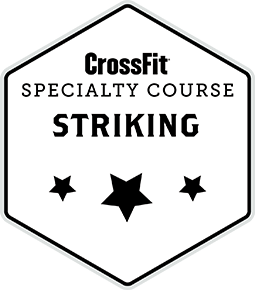 The CrossFit Workshop: Striking is a single-day immersive experience that teaches participants how to increase overall fitness, core strength, rotational speed and power by incorporating striking drills into CrossFit workouts. Strikes are some of the most functional movements because punching and kicking with true power, speed and accuracy require people to utilize their entire body. This is why fighters are some of the most well-conditioned and powerful athletes in the world. With this in mind, the Striking Workshop is designed to teach participants to incorporate basic mixed-martial-arts, boxing and self-protection striking concepts into workouts. The course also teaches attendees to program these skills into workouts for greater variance. All this is done in a non-contact format that focuses on proper technique by using shadow boxing, focus mitts, kick shields and a heavy bag. The CrossFit Open will begin on February 22nd. The Open is an official CrossFit competition where competitors perform 5 workouts in 5 weeks. The workouts will be done in our gym. If you’d like to see how you stack up against the rest of the world than register in the link provided below. If it’s not your thing no problem. We’ll all be doing the Open workouts as part of our regularly scheduled training. Being a registered competitor adds to the fun and excitement and competitors usually walk away with an improved performance just by being in the mix of competition. What questions do you have? Registration for the Open begins Thursday, Jan. 11, 2018. The Open is the first stage of the CrossFit Games season and the largest community event of the year. Every year, hundreds of thousands of athletes come together to compete in the worldwide, online competition. Anyone aged 14 or older can compete. All you have to do is sign up at Games.CrossFit.com and log your score each week. Workouts are released on Thursdays at 5 p.m. PT, and athletes have four days to complete the workout for the week and submit their score. Scores are due before 5 p.m. PT the following Monday. Complete the workouts at a CrossFit affiliate with a judge, or film your effort from anywhere in the world and submit a link as proof. The Open offers two versions of each workout, scaled and Rx’d. The scaled option makes the event all-inclusive. All athletes can compare their results to others worldwide, regionally, by age or within their own gyms. An official CrossFit Games app will be available in late January, which will focus on your own personal performance in the Open. At the end of five weeks, the fittest move on to the next stages of competition: the Regionals and the Online Qualifier. CROSSFIT JUDGES COURSE If you’ve been training with us for at least one year please consider taking the CrossFit Online Judges Course. We will need judges for 5 weeks of Open workouts. We recommend the course to members who will not be competing, as well, because it is an education in movement standards. There is a $10.00 fee to take the course.